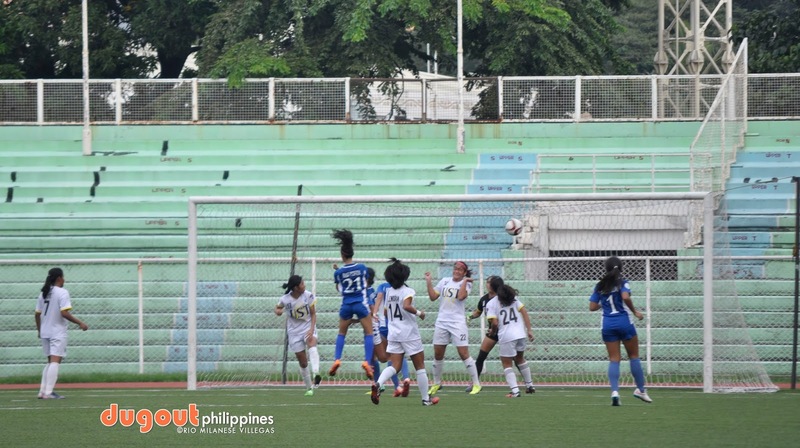 MANILA--The Ateneo Lady Eagles bagged third place after winning an exciting playoff against the Santo Tomas Tigresses, 4-3 in the final day of the PFF Women's Invitational Cup at the Rizal Memorial Stadium on Sunday. A fifteen-minute blitz in the second half courtesy of Martie Cinelle Bautista, Maria Teresa Bernardo and Camille Rodriguez complemented the first-half header by Pamela Denise Diaz to cap off an exciting tournament for manager Angelica Tiu, who filled in for Robert Manlulo today. The goals by Charisa Lemoran and Jennizel Cabalan and an Ateneo own goal were not enough for Aging Rubio's side. The Tigresses almost drew first blood three minutes before the match began., but the result from the corner went for naught. Ateneo made UST pay for those misses in the sixth minute. Coming off the corner kick, the header by Diaz went across the line to register her second goal of the tournament. The heat of the capital was punishing both sides as the officials called two water breaks in the first half. But that did not deter the Tigresses as Charisa Marie Lemoran equalized before the half-hour mark with her left-footed shot past Eva Montelibano who earlier replaced starting goalkeeper Rianne Caparos after the latter went down in a collision with a UST booter. Montelibano herself went down as well five minutes before the half time whistle, forcing them to convert defender Kimberlee Jimenez to guard the posts. Bolstered by the Yellow Jackets, the Tigresses resumed their ferocious attack on the restart and were rewarded when a shot by Lemoran deflected off Catherine Cabrera for an own goal that gave the España ladies the lead, 2-1. Ateneo equalized fifteen minutes from time when Bautista latched on from Bernardo's cross and slotted it into the empty net to put the match knotted at 2-2. However, it was Rodriguez who had won it for the Katipunan ladies three minutes from time. She received Annika Ong's cross to beat Reyes on a standing header for her third strike of the tournament.